Well, it has certainly been a year -- and 2018 is, thankfully, almost over. While we look ahead to 2019 and its promise of murderous robots and their tears in the rain , let's look back on this last orbit around the sun through that most elegant of art forms: the editorial cartoon! 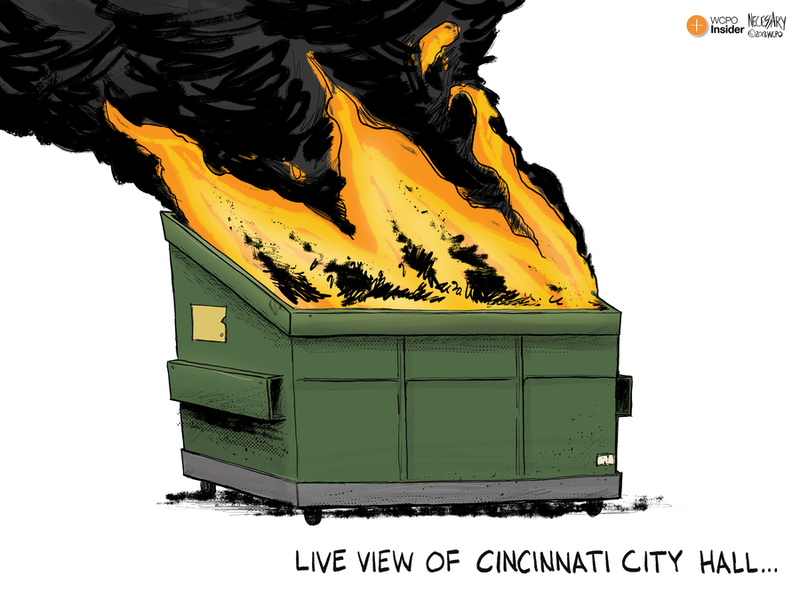 You would be forgiven to think I drew this cartoon for the current Bengals season. 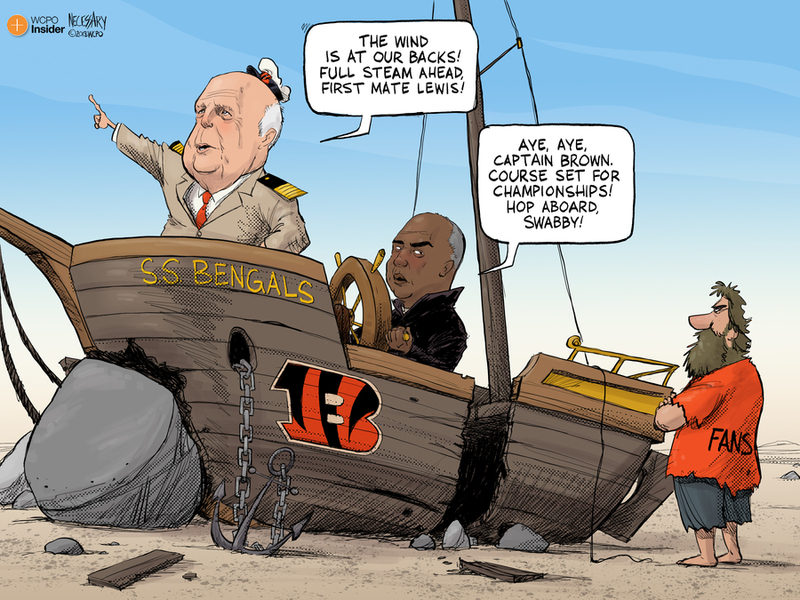 But no, I sketched Skipper Mike Brown and his faithful first mate, Marvin Lewis, staying the course while trying to persuade fans not to jump ship. The Bengals aren't the only major Cincinnati sports team that struggled this year. The Reds had a historically bad start to their 2018 season. (And the less said about the bifurcated Opening Day festivities, the better.) 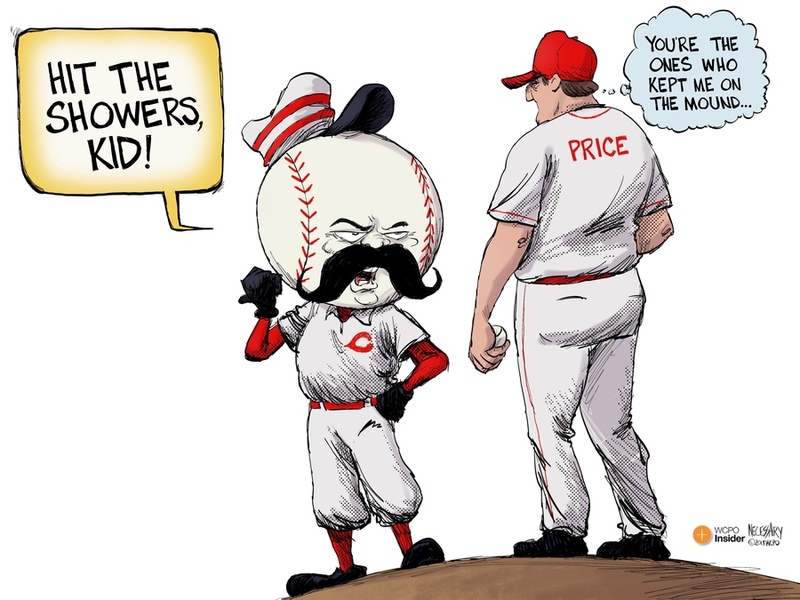 Bryan Price was finally given the boot , and while interim manager Jim Riggleman gave us a brief spark of hope, the Redlegs ultimately collapsed. Here's to yet another rebuilding season. What's the bright glow and cloud of billowing smoke? Why, it's Cincinnati City Hall, engulfed in a combustible cluster of scandals. The feud between Mayor John Cranley and city manager Harry Black reached a head and led to Black resigning his position. Radioactive fallout from the Cranley/Black nuclear exchange continues to spread over the city with the "Gang of Five" text message war. 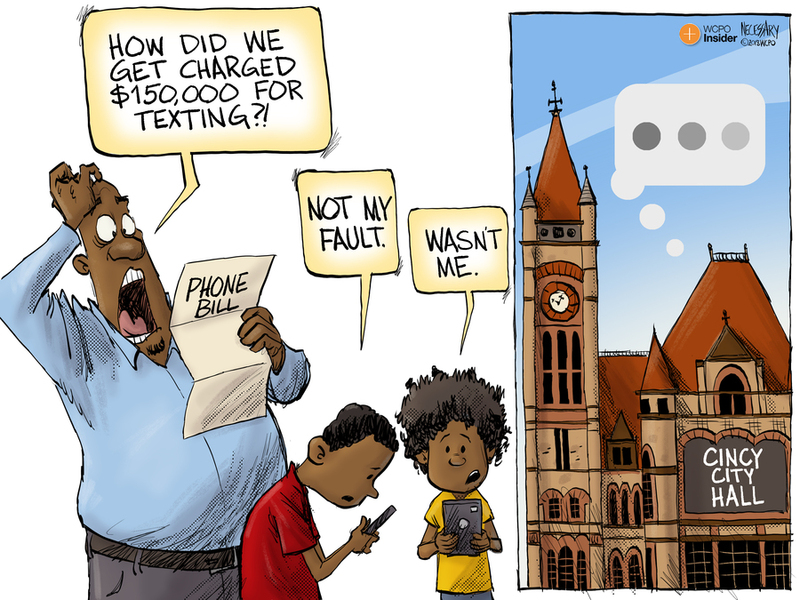 A conservative watchdog sued five City Council members who discussed Black's firing over text message, stating that the texts violated open meeting laws. Countersuits, public sniping and a (possibly) racist tweet followed. But best of all is the legal fee for this mess, which is being passed on to us taxpayers . An 11-year-old girl shoplifted from a Kroger. 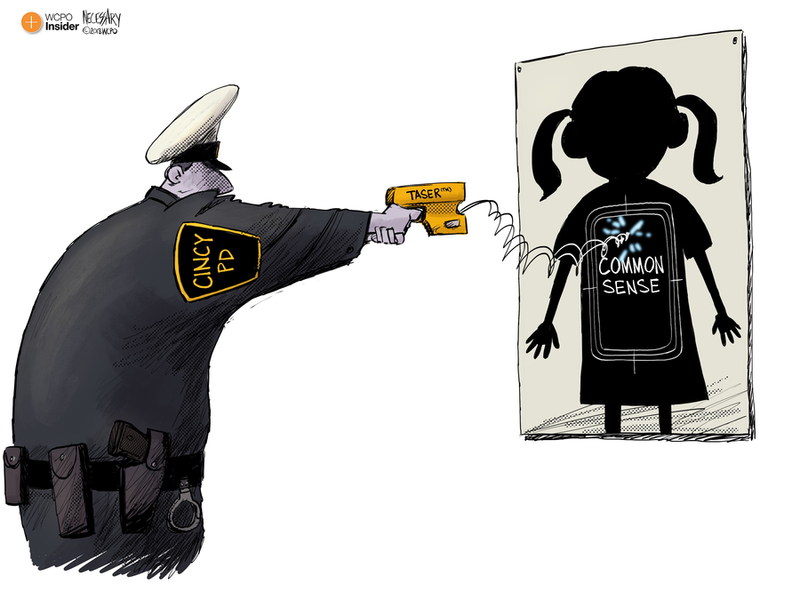 Obviously, the proper response from a Cincinnati Police officer was to shoot her with a stun gun. Because those 11-year-olds are dangerous and more than any trained police officer can handle, right? What's even more shocking is how this wasn't an isolated event . Can I see your ID ... and another ID ... and another? Ah, the Ohio Bureau of Motor Vehicles. Who doesn't love taking a chunk out of their day to wait in Soviet-era bread lines only to get a horrible picture that you're stuck with for the next four years? But this year, Ohio licenses now meet federal requirements for domestic air travel. 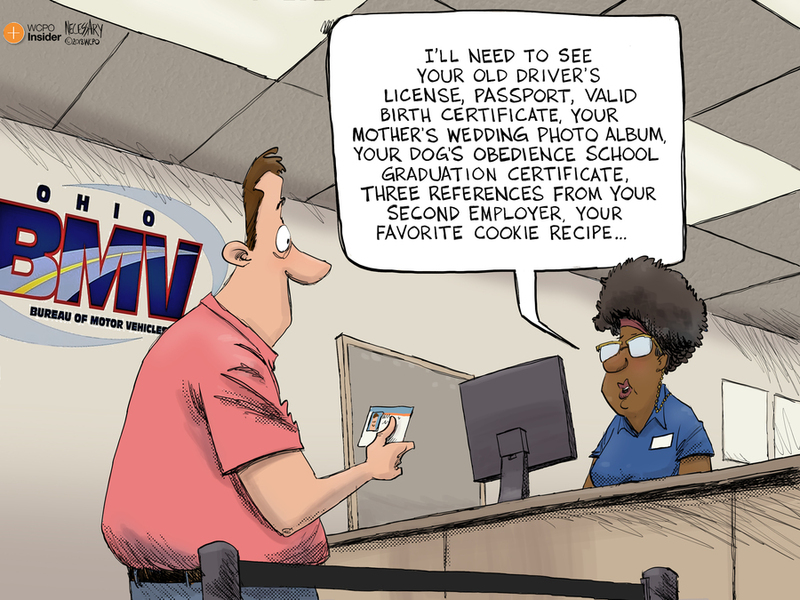 If you want a driver's license that can be used as your ID at Cincinnati/Northern Kentucky International Airport, you need to bring multiple forms of ID into the BMV that include your full name, date of birth, address, Social Security number, high score on Pac-Man and your favorite recipe for chocolate chip cookies . And, like any good bureaucracy, the BMV didn't clearly inform citizens of the change. Donald Trump declared a trade war with, well, the rest of planet Earth this year, leveling tariffs on a number of imports. Earth retaliated with tariffs aimed at hurting Trump's base and political allies. 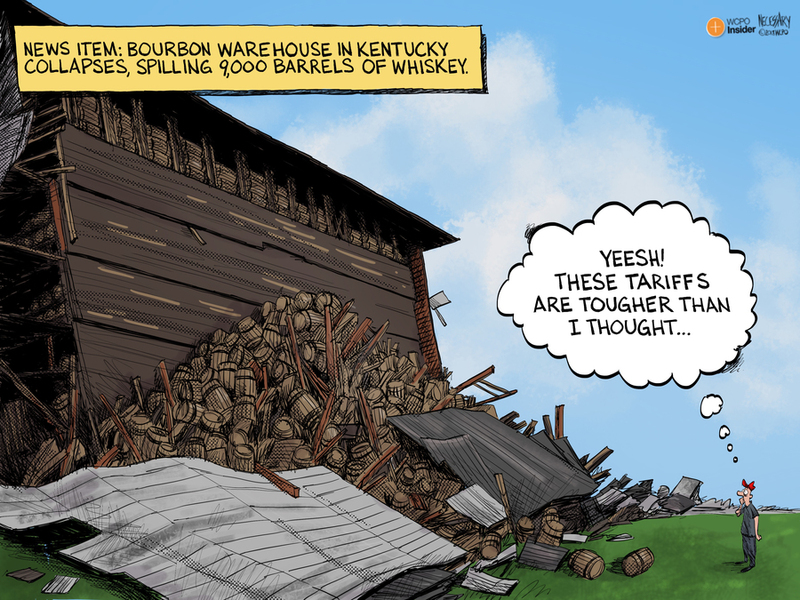 One such tariff was on bourbon, lobbed specifically at Kentucky Sen. Mitch McConnell. Soon after, a rickhouse at the Barton 1792 Distillery collapsed , destroying thousands of barrels of bourbon. Coincidence? I think not. Mass shootings still plague our country. While all gun violence is deplorable, perhaps the worst are the school shootings. Seventeen students from Marjory Stoneman Douglas High School in Parkland, Florida, were the victims of a mass shooting on Feb. 14, and 10 people were killed May 18 during a shooting at Santa Fe High School in Texas. 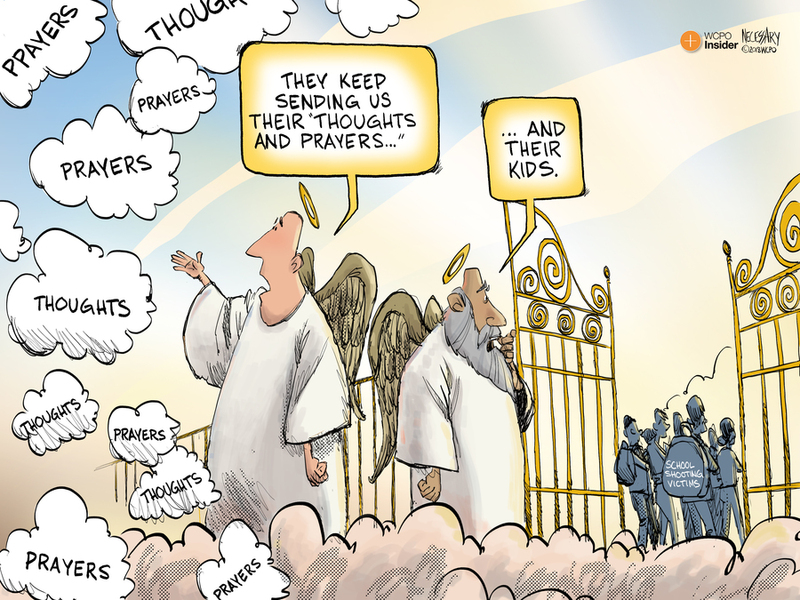 Lawmakers and lobbyists send their "thoughts and prayers" every time one of these heinous crimes occurs. If only they would do something to actually stop the shootings in the first place. A usually busy Fountain Square was empty Thursday afternoon, except for a single piece of yellow tape. Down the street, a woman screamed and sobbed in the arms of a Cincinnati Police officer. I was preparing for my grandmother's funeral when I saw that there was a shooting. The heart of my family was gone. To see that the heart of my city was on lockdown was almost too much to bear. 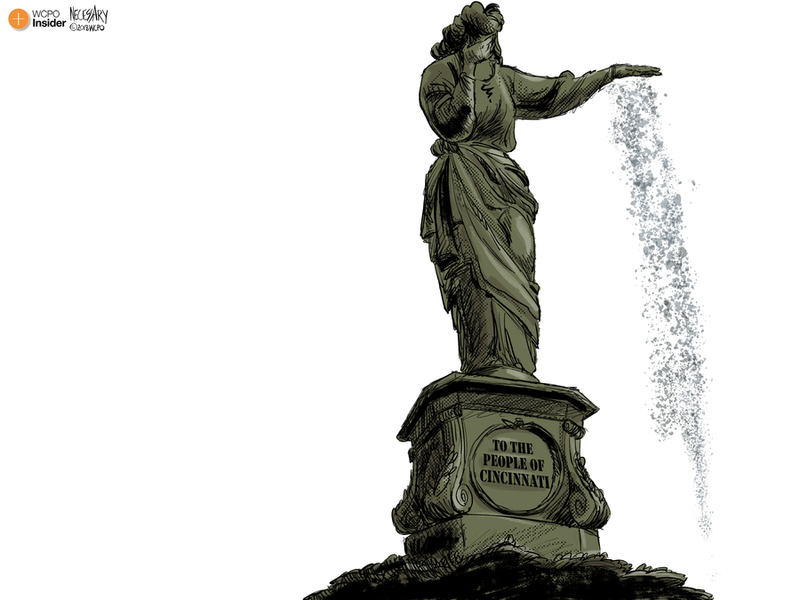 I quickly sketched this cartoon to try to express the grief that I — and many others — felt that day. The next afternoon, after my grandmother's burial, my wife and I went to the vigil on Fountain Square, surrounded by friends and fellow Cincinnatians. Together, we cried. We mourned the victims. We hailed the police officers who risked their lives to save others. Mostly, we supported one another and our city. Fountain Square was empty that terrible Thursday afternoon, filled with sobs and screams. That Friday it was crowded and filled with love.